Amid speculation in recent weeks, it is now confirmed the widely anticipated International Champions Cup (ICC) will be held in Singapore this coming July at the National Stadium. Not only the Republic will be the first country in the South East Asian region to play host to this prestigious tournament this year, she also earned the right to host the tournament for the next three years. Since its inception back in 2013, the tournament featured some of the biggest names in world football with the match between Manchester United and Real Madrid in August 2014 witnessed a record turnout of 109,318 fans at the “Big House” (Michigan Stadium) at the University of Michigan - the largest attended soccer match in U.S. history. Scheduled to take place from 25th to 29th of July, the ICC Singapore will feature Chelsea FC, FC Bayern and FC Internazionale in a round-robin three-match tournament. The fixtures in July will mark the first time top flight European teams play each other in Singapore. "Singapore is a natural choice due to its location, efficiency and more importantly, the nation’s passion for international sporting events,” said Mr. Patrick Murphy, President and Chairman of Catalyst Media Group (CMG), the exclusive developer of the International Champions Cup in the Asia-Pacific region, on the decision to host the tournament in the Lion City. “The ICC has revolutionized the pre-season touring experience for the world’s biggest and best football clubs and we are pleased to be able to expand the event and bring the tournament to Southeast Asia." added Murphy in a media release issued in regards to the announcement of the ICC Singapore. Patrick Murphy, President & Chairman, Catalyst Media Group. The hosting of the ICC Singapore is a collaboration between CMG and the Singapore Tourism Board (STB) as both parties inked a four-year partnership to anchor the ICC in Singapore in a press conference held this afternoon at Mandarin Oriental Hotel. In attendance at the same event were the likes of Tore Andre Flo, Hasan Salihamidžić and Francesco Toldo representing Chelsea, Bayern and Inter respectively. Beside the partnership with STB, CMG also announced agreements with Sport Singapore, Singapore Sports Hub, Mediacorp and Football Association of Singapore. The various partnerships ensure that the local community will benefit from activities that will be organized in conjunction with the inaugural ICC Singapore 2017, as mentioned in the said media release. Tickets will be available from March 30 at www.sportshubtix.sg, the Sports Hub Box Office as well as at all Singapore Post outlets. 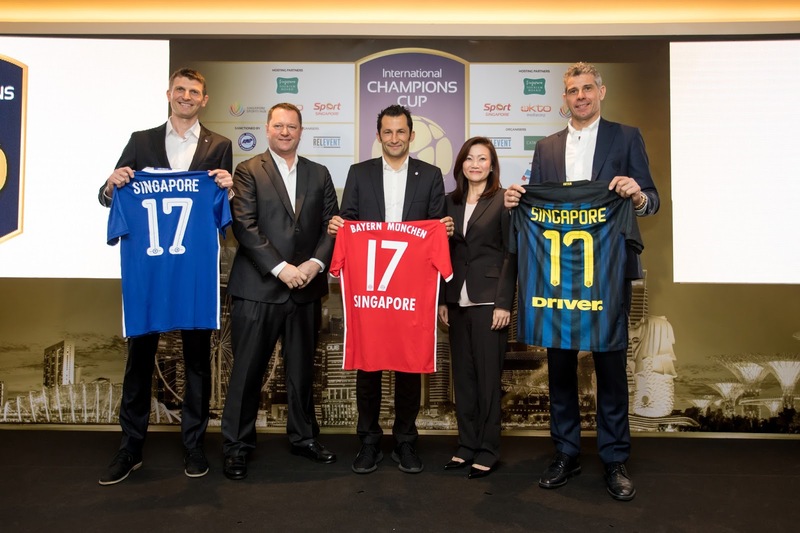 Tickets start from $25 (child) and $40 (adult) for the International Champions Cup Singapore. Please visit www.internationalchampionscup.com for more information.